Welcomed into God’s loving arms, peacefully with family by her side on March 29, 2019 at 88 years of age. Devoted wife to the late Achille (January 17, 2019) for 64 years. Loving mother of Antonietta (Luigi) and Domenic (Maria). Adored nonna of Nadia (Patrick), Orazio (Genny), Victoria and Olivia and bis-nonna of Giorgia, Greta and Antonio. 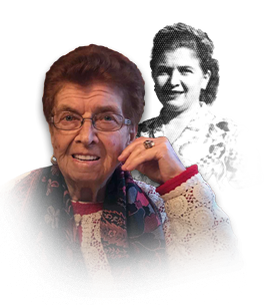 Dear sister of Merseda Dimanno (John), Antonietta Turcano, Orazio (Teresa) Turcano and predeceased Frank Turcano (Antonietta), Lidia Turcano and Maria (Antonio) Coletta. Dear sister-in-law of Teresa Marsella and predeceased by brothers-in-law and sisters-in-law Panfilia Forte (Magno), Donata Nardone (Tomasso), Nazareno Marsella (Maria) and Raffaela Turcano (Antonio). She will be sadly missed by many nieces, nephews and cousins in Italy and Canada. She lived life to the fullest and was caring and loving to all who knew her. If you so desire, donations to Autism Windsor & Essex Chapter would be appreciated by the family. Visitation Sunday March 31, 2019 from 5:00-9:00 p.m. Parish Prayers Sunday 7:00 pm. Funeral Monday April 1, 2019 10:15 am, leaving in procession from Families First 3260 Dougall Ave. South Windsor, 519-969-5841to Assumption Church, McEwan Campus (711 McEwan Ave.) for a Funeral Mass at 11 am. Procession to Heavenly Rest Cemetery to follow. Additional Information	Parish prayers Sunday at 7 p.m.
Procession leaving from Families First at 10:15 a.m.